I frequently like to play a game with myself along the lines of desert-island discs called desert-island meals. 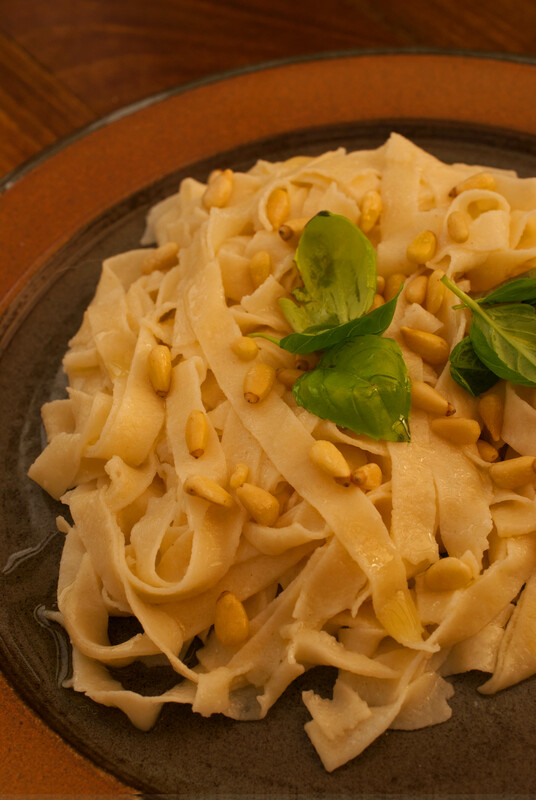 Disregarding all notions of nutrition/what would help you survive on said island, fresh pasta would have to be on the list (along with pesto, chocolate mousse, and some sort of salad to keep Mum happy). Realistically, it would be the last thing I would want to eat if being marooned on an island did actually happen. Not to mention the unlikelihood of having a convenient pasta maker to hand. But, logistics aside, it really is something that I would be happy to eat until the end of my days. 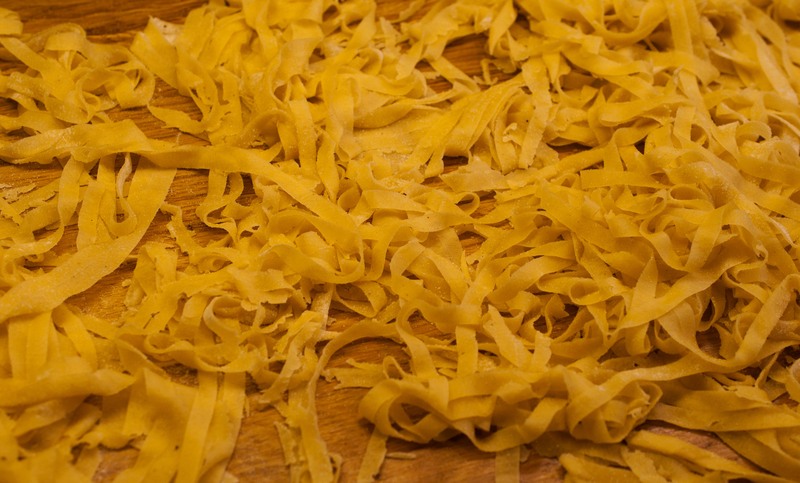 Fresh pasta is a different thing entirely from dried pasta. Yes, it is a bit of an effort to make – the mixing, kneading, resting, rolling takes time – but I’m always convinced that it’s worth it in the end. 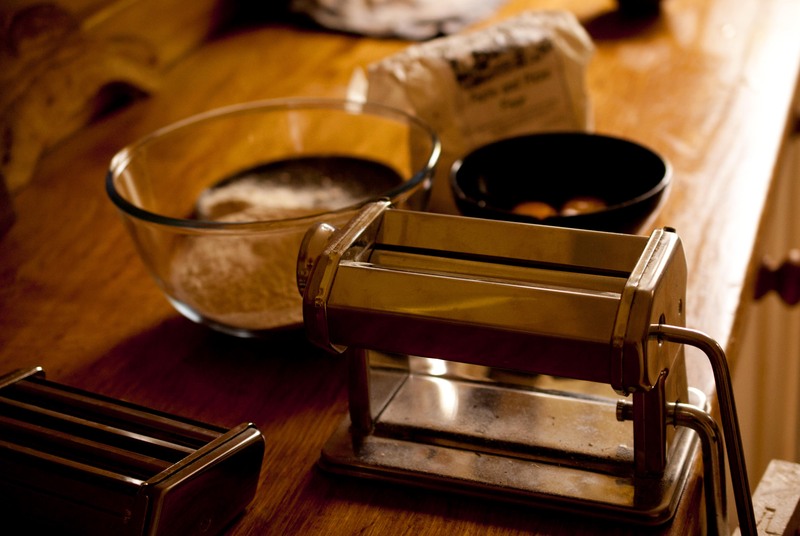 A pasta maker is pretty much a necessity to get the dough thin enough – I tried it once with just a rolling pin, and it was disappointingly thick and chewy. You need reinforcements in the form of willing volunteers to help coax the pasta through the rollers. I had three helpers to hold the ever-lengthening sheet of dough. If you are Italian, maybe you can do it single-handedly, but this would be quite a feat. I sometimes serve the pasta with homemade pesto, but it really doesn’t need much embellishment. This time I went for parmesan, olive oil, salt, pepper and a few basil leaves. A green salad was meant to be an accompaniment, but having got so involved with making the pasta I completely forgot about it, so we had a salad course afterwards. 250g ‘00’ Italian pasta flour, plus more for dusting. First, sift the flour into a large bowl and make a well in the centre. Add the eggs, egg yolks, salt and olive oil and gradually work the mixture together to form a dough. Knead on a floured work surface for 10 minutes, until the dough feels soft. Leave to rest for about an hour. With a rolling pin, roll the dough out until it can fit through the widest setting on the pasta machine (about 1cm). Gently feed through the rollers. You might need to roll it through a few times on the widest setting until it will go through smoothly. Carefully patch up any holes that appear in the dough. Then roll the pasta through from the thickest setting to the thinnest, dusting with flour as you go – you should almost be able to see through the pasta at the end. 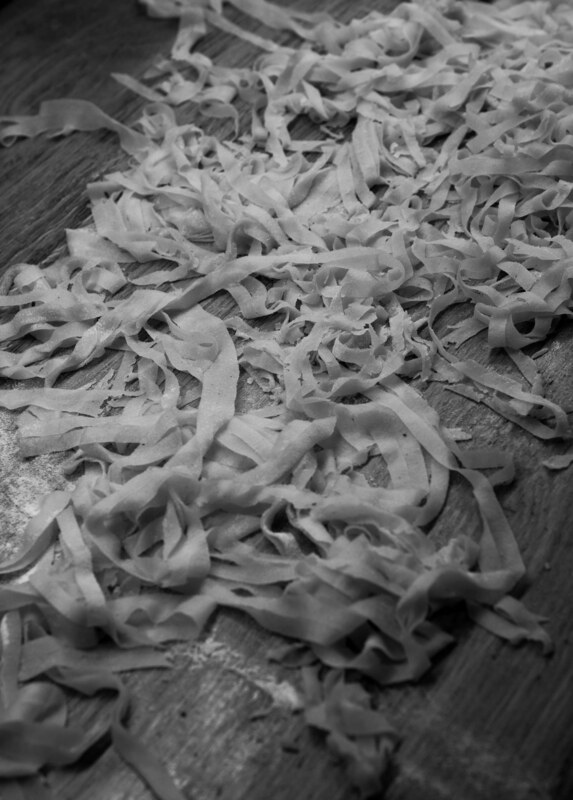 Then cut into whatever shape you like – I usually go for tagliatelle, as I find spaghetti gets too tangled. Get a large pan of salted water boiling, then drop in the pasta. It literally take a minute to cook, if not even less. Drain, drizzle with olive oil, season with lots of salt and pepper, scatter over basil leaves and grated parmesan. This entry was posted in Made from scratch, Pasta and tagged eggs, homemade, Italian, olive oil, pasta. Bookmark the permalink.